Brooke, the kids and their dad are all doing great and feel like they can handle anything that’s thrown at them. Brooke was apprehensive about this whole home-visit thing. A couple of people had suggested that she contact Nurse-Family Partnership® for support, but she hesitated. She finally made the call to Fargo Cass Nurse-Family Partnership when she was 27-weeks pregnant with her twins. 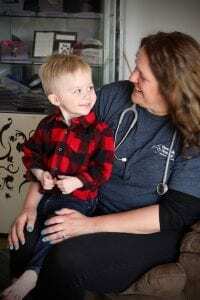 Only after nurse Kara came to her home in Fargo, North Dakota did Brooke understand. Serving coffee was not part of the program. Instead Brooke found in Kara a friend who told her what to expect during her pregnancy, how to prepare for labor and delivery, and how to handle the challenges that lay ahead when she would bring little Lennox and Linkin home. Brooke and her partner, Kellen, had looked forward to becoming parents, but they were speechless when at her first ultrasound at 21 weeks, the technician mentioned that he saw twins in there. “We kind of giggled awkwardly and didn’t say anything for about five minutes,” she said. Frequent ultrasounds for the rest of the pregnancy revealed that Linkin was not growing at a normal rate, so her doctor recommended they induce labor at 35 weeks. After 24 hours of labor and with signs of stress on the boys, Brooke had an emergency C-section. After 14 days in the NICU, it was time to take the babies home, and Brooke and Kellen began what was to be an odyssey of caring for two adorable but frail little boys. “Feeding was a big issue,” said Brooke, who recalled learning how to breastfeed, pump milk around the clock for supplemental feedings, and how to enrich the milk with formula and bottle-feed the boys to help them gain weight. “We had to monitor their weight and it was great because Kara came weekly and brought a scale with her so I didn’t have to take them out in the ice-cold weather to be weighed,” she said. The boys had frequent respiratory problems. Brooke said a simple runny nose could spiral into cold-induced asthma and severe breathing problems, requiring urgent care, steroid medications, nebulizers and many long nights. Kara helped them deal with those challenges and taught them how to access speech therapy and other services when the boys showed signs of falling behind in some developmental stages at around six months. The boys had numerous food allergies, a neck condition known as torticollis, an eye condition that required surgery, and went through a rough phase of biting each other. “Kara always had good ideas,” Brooke said. “She had suggestions from her own experiences as a parent, and she brought pamphlets and lots of information from the research she would do. She recently returned to her job as an oral and facial surgery assistant and enrolled the boys in day care. She and Kellen, who works as an HVAC technician, are a talented team, juggling the breakfast duties and supporting each other as the boys come home with the inevitable colds and viruses that toddlers share at day care. “We were all getting a little stir-crazy,” Brooke said, admitting that she was ready to return to work. The boys were nurse Kara’s first set of twins and she cared about them so much. She never gave up on anything. In two years, Brooke said she went from “clueless” to a “very confident” mother, and much of that transformation was due to Kara’s help. “The boys were her first set of twins and she cared about them so much. She never gave up on anything,” Brooke said. “If I had a question, I would ask Kara. I could talk to her about anything. I was never shy or scared. If she didn’t know the answer, she would find out. “Now, the kids are so great and their dad and I are so great. We’ve been through a lot. Anything that’s been thrown at us, we can handle.